deadman started a topic Another budget phony clone? I suppose this is sort of a build thread/intro for myself. Not sure if it belongs right here but unless someone says otherwise I'll continue. I've spent most of my focus in the past on old military pistols (mostly 1911's) but have always wanted to expand into precision shooting. The M40 type rifle seemed to suit me, so here goes. Its not an accurate copy, probably never will be. I'm starting with a Rem SPS in .308 and am working on changing things out to bring it a little closer as time and money allow. Aiming more for "inspired by" than anything else I guess. So far, not much to report. 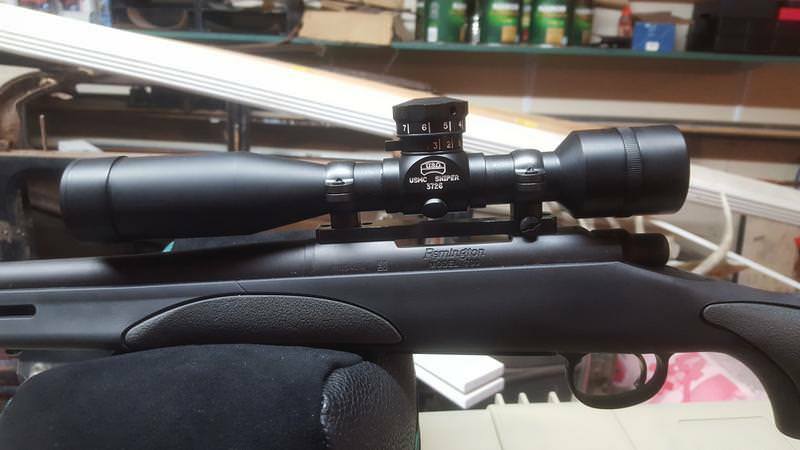 I mounted an MST-100 with a Leupold base and rings, they were readily available. Not sure about the windage adjustment on the base, might look into an alternate setup. I'm currently working on getting a stock ordered from McMillan, but that won't be ready for a while so I have to deal with the factory plastic stock in the meantime. I got out shooting with it last weekend, I think I've sort of got the zero figured out. The rifle seems to shoot well, but I've never really focused on precision before so I could be way off. 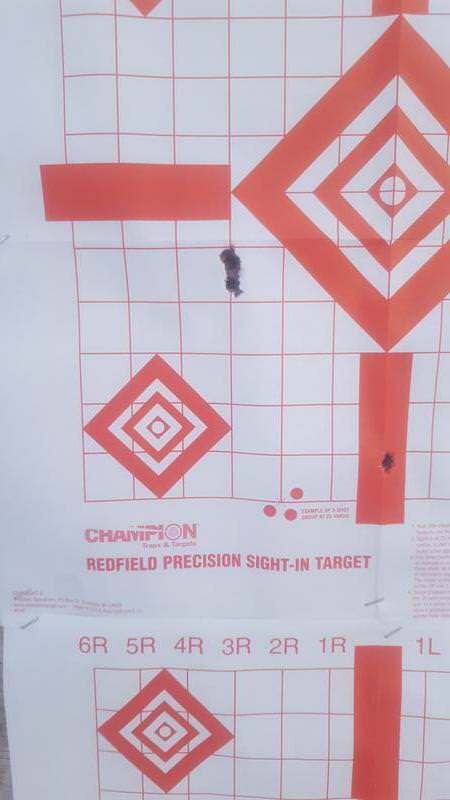 I was using a couple bags to shoot, by the time I finished this was the kind of result I was getting at 100 yds. I need to fine tune my zero, I'm slightly right at 100. Having some issues with the adjustment on the scope, part of it might be the fact that I was trying to fiddle with it while not having a rock solid rest. I'm hoping to get out again in the next few days for another attempt. I hope a new day will produce an improvement, it had been a while since I've been out shooting. Once I get 100 yd shooting figured out, I'll worry about pushing it out further. Does anyone here have a recent/current McMillan stock? I have one ordered, been patiently waiting for it, and now I'm wondering: what is it going to look like? Is it going to have a funky pattern? I didn't think to ask for anything out of the ordinary, just wanted an M40ish type pattern. I'm kinda hoping whoever works on it is feeling artistic! Good for you. Now you have a start and can keep upgrading or building another, and still be shooting. Well this project has changed some since I posted last about it. Waiting for my new stock turned out to be too hard, so I bought a used A5 to use in the meantime. Different mount for the MST, and I've been putting rounds downrange as often as I can get out. I will still be putting an A1 stock on it, but this keeps me shooting for now. I've only been shooting out to a little over 300 yds with it, I can't shoot tacks with it but on a good day I can pull off a couple of decent-ish groups. My thinking exactly. I’m brand new to all this so things may change as I go, but the starting point will probably be the same! I'm also going to take some liberties with some of the smaller stuff (like the Leupold base). One thing this rifle needs soon is a trigger. Going to try a TriggerTech (suggested by ArmedGinger). Read some good reviews on them and they don't look that expensive. Another thing that needs to go is the mushy recoil pad. I am going to swap something better on this plastic stock while I wait for the McMillan. A return stock would be great but from what I've seen they are probably out of my price range. Plus it might be tough finding someone willing to part with one if they knew where it was going. Well its not so much of a "build" yet haha. Very early in the project. AG: you should recognize it, I've been hounding you for info these past few weeks! I'd like to avoid going down the path of chasing expensive parts but I am pretty sure I'll be trying to get even the little details by the time its done. I'd like to settle for "close enough", at least at a first glance. For now, I'm going to shoot the hell out of it and try learning what works best for me. 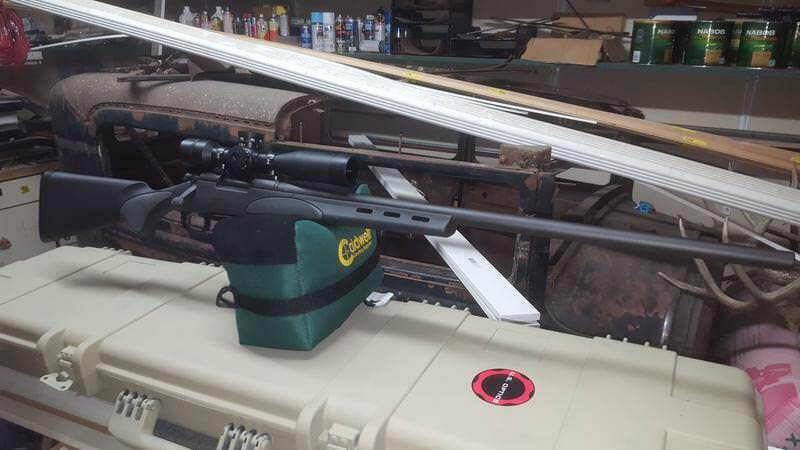 A lot of my buddies (and myself) are hunters/shooters, but its amazing how few people out there can actually take a shot at even 3-400 yds with confidence let alone make an accurate shot. Part of my goal in this is to be one that can. It'll be a while before I worry about 5-600 and beyond, but there's time for that after getting the basics I figure. When Dicks had a sale on cheap ADL Varmints in the plastic stock I talked a friend into buying one. I had a 1968 wood stock to give him and found some cserviceable items on SnipersHide to fit it out. Its now a "M40ish" clone and his favorite rifle. The experience can be had without breaking the bank. Very nice start to a clone'ish build. I have a MST-100 but I have not had any problems adjusting the windage per the manual. If you do not have a copy of the manual there is one posted on this site (somewhere).